If you are in Panama you can’t miss a walk in the Old Quarters (Casco Antiguo) and learn about the amazing history of the Isthmus. The beautiful architectonic styles, narrow streets and cafes will fascinate any traveler looking for a bit of authenticity in this cosmopolitan Panama City. In colorful Casco, the Spanish and French colonial houses mixes with the art deco and neoclassical style. If you go for the first time, don´t miss the Church of the Golden Altar and the Flat Arch. The Golden Altar: The massive golden altar (altar de oro) is a prime tourist attraction at Iglesia de San José (Avenida A between Calle 8 and Calle 9, 7 a.m.– noon and 2–8 p.m. Mon.–Sat., 5 a.m.–noon and 5–8 p.m. Sun.). Legend has it that the altar was saved from the Welsh pirate Henry Morgan during the sacking of the original Panama City when a priest ordered it painted black, hiding its true value. The Flat Arch: The original Iglesia de Santo Domingo (Avenida A and Calle 3 Oeste) was built in the 17th century, but it burned twice and was not rebuilt after the fire of 1756. It remains famous for one thing that survived, seemingly miraculously: the nearly flat arch (Arco Chato). Since it was built without a keystone and had almost no curve to it, it should have been a very precarious structure, yet it remained intact even as everything around it fell into ruins. One of the reasons a transoceanic canal was built in Panama was that engineers concluded from the intact arch that Panama was not subject to the kinds of devastating earthquakes that afflict its Central American neighbors. The United States took over the task of construction of the Panama Canal on may 4, 1904, after quite a debate as to where would be the best site for this project, even after the French had already started construction in Panama. The U.S. considered five routes before deciding to continue the work the French had already begun. As you can see below, these routes included (1)through the narrowest point in Mexico, (2) through Nicaragua, (3) the French route through Panama, (4) a second route through Panama going roughly from the Gulf of San Blas to Chepo and (5), through Colombia using the Atrato River. 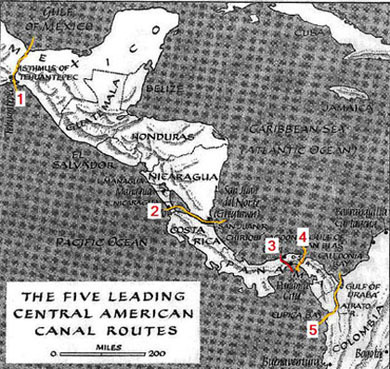 The French had considered several alternatives canal designs including their initial effort for a sea level canal and, later, on their second attempt, a locks canal. With greater engineering information, the U.S. abandoned the French design and proceeded with a locks design based on a large lake 85 feet above sea level. The French sea-level design suffered greatly from the large volume of excavation required and from flooding that would have occurred along the Chagres River. By constructing a dam (Gatun Dam) near the mouth of the Chagres, the combined effect of reducing excavation and mitigating flood impacts was achieved at the cost of constructing the locks. The Panama Canal watershed is 1289 square miles drained by six major rivers of which the Chagres is the largest. Five major stream gages keep track of the flow from these rivers into Gatun Lake. 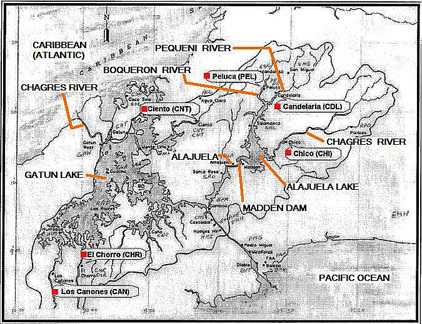 These stream gage locations, shown in the map below, are: the Gatun River at CIENTO; the Boqueron River at PELUCA; the Pequeni River at CANDELARIA; the Chagres River at CHICO; the Trinidad River at EL CHORRO; and the Ciri Grande River at LOS CANONES. When the canal operations began in 1914, it became evident that, for water management purposes, another dam was needed. And it had to be above Gatun Lake. Thus, on October 13, 1931, construction on another dam was begun up the Chagres near the location of a little town called Alajuela. The dam was named Madden, after U.S. Congressman Martin B. Madden, Chair of the House Appropriations Committee, who played an important role in support of the project. 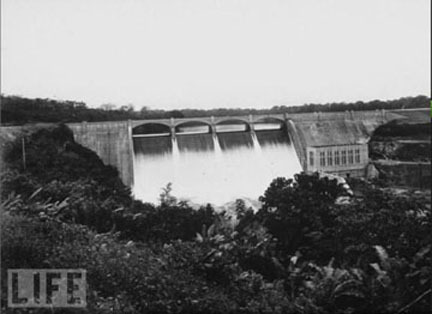 The dam would not only help control the tremendous floods of the Chagres, but also hold water in reserve for periods when traffic through the canal was at its highest point. And additional benefit was the hydroelectric power it generated for use in the operation of the canal. Madden Dam is located 250 feet above sea level and retains 29 million cubic feet of water. It was constructed by the engineering companies of W.E. Callahan and Peterson, Shirley & Gunther of Omaha for $4,047,407 (Note 1) which was a lot less than had been estimated by the Isthmian Canal Commission. The design and construction work was under the direction of E.S. Randolph, who stayed at the job site through out its construction. The contract was signed by General Burgess, who was the Governor of the Canal Zone at the time. 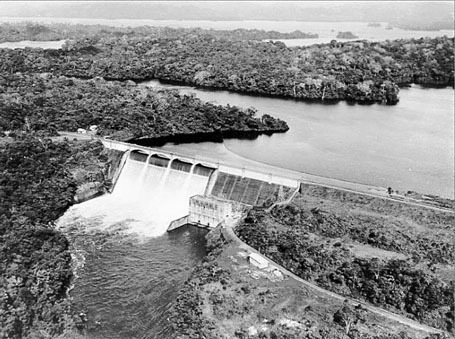 Madden Dam and what is now called Alajuela Lake. Photo by Panama Canal Co. The resulting lake was called Madden Lake for many years but, eventually, this was changed to Alajuela Lake. This lake has a perimeter of 189 miles. The dam is 930 feet long and rises 220 feet from its foundation. Up to 893 persons, divided almost evenly between the contractor and the Canal Zone government, were employed during its peak construction period. Completion of the dam was accomplished on February 5, 1935, five months ahead of schedule and was hailed as another triumph of U.S. engineering in the history of the Canal. The Canal Zone government proceeded to build a concrete paved road 12-1/2 miles long connecting the new dam to the town of Summit. Madden Dam shortly after completion. LIFE magazine. Madden Dam is maintained and operated by the Panama Canal Authority. This large reserve of water has lived to its expectations providing water to (1) help maintain water levels necessary to operate the canal during the dry season, (2) control flooding of the Chagres and (3) providing hydroelectric power for the area. NOTE 1: Dr. Roy states that the contract for the dam was $4,047,407. However, industcards gives a figure of $$10.6 million.